PATIENT SAFETY IS ALWAYS OUR PRIMARY CONCERN. DOSE REDUCTION IS OUR PRIORITY. Preventing accidental or isolated incidents of excessive exposure. Reducing cumulative radiation dose, which is the sum total of radiation received by a given patient over time. Focusing on nationally accepted guidelines to assure that we always give the lowest effective dose of radiation possible. HERE ARE THE WAYS WE ARE WORKING TO MINIMIZE BOTH ACCIDENTAL AND CUMULATIVE RADIATION DOSE. Employees follow strict procedures for checking and double-checking patient information and the type of exam to be performed. These simple steps can prevent an unnecessary exam. The most important tool we use to reduce radiation exposure is called a "protocol." A protocol is simply a detailed description of how each exam should be conducted - how much radiation to use, how many passes to make over what part of the patient's body, and so on. We have hundreds of protocols for all types of exams on all types of machines, including CT scanners. Our goal is to reduce the dose as much reasonably possible for all exams. We customize the radiation dose according to the patient's weight, age, medical history and the body part being scanned. This is especially important for pediatric patients, as well as patients who must receive frequent scans as a part of their care. THE RIGHT IMAGING EXAM, AT THE RIGHT TIME, WITH THE RIGHT RADIATION DOSE. If you have any concerns at all about receiving radiation, a staff member will be glad to explain your procedure in greater detail. 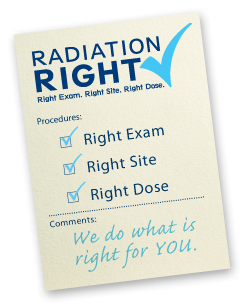 Radiation Right® is for our patients whose tests, ongoing treatment or other medical procedures could expose them to medical radiation. Your physician and members of your care team want you to understand the possible benefits or risks involved and the steps we are taking to ensure your safety. Your physician can best explain benefits that might be gained by undergoing a computed tomography (CT) scan or an interventional radiology procedure, such as a balloon angioplasty, fluoroscopy (X-ray), ultrasound, magnetic resonance imaging (MRI) or another type of procedure. Studies have shown that in addition to benefits, there might also be risks that should be considered by patients and those treating them. Some government agencies and medical organizations have stressed the adoption of two guiding principles of radiation protection for patients: appropriate justification for ordering each procedure and careful optimization of the radiation dose applied during each procedure. Radiation Right® incorporates these baseline recommendations but adds additional steps, including: adoption of education and competency standards for clinical professionals, meeting and achieving nationally recognized certification standards and adopting "As Low As Reasonably Achievable" or ALARA dose protocols. Radiation Right® also follows The Alliance for Radiation Safety in Pediatric Imaging's "Image Gently" protocol for pediatric patients. We consider alternative exams to achieve the desired test result and minimize exposure to ionizing radiation. We verify that patients receive the right test or procedure using The Joint Commission Universal Protocol. 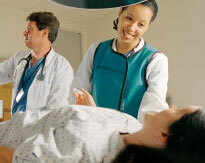 We follow nationally accepted guidelines to assure that we always give the lowest effective dose of radiation possible. 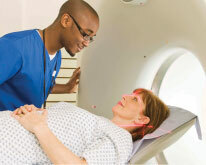 • You have had another imaging procedure (X-ray, CT scan, Angiogram, Mammogram) within the past six months. • You have a health condition or medical history that requires frequent or repeated imaging procedures, or you are currently receiving or have recently completed radiation therapy treatments. • You have had a surgical procedure within the past six months.